Naturally, serving as a Kiva Fellow in Guatemala during the country’s most vibrant and colorful time of year, I was excited to check it all out. 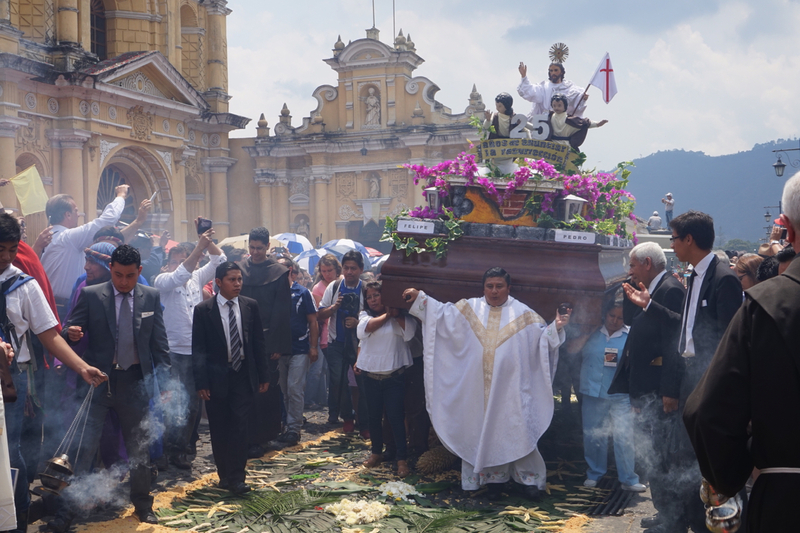 From the most traditional and famous processions that take place in the hot spot colonial town of Antigua (known for being second to Spain for having the most fascinating processions) to some of the largest ones in the capital of Guatemala City, here’s a glimpse into how Guatemaltecos celebrate Semana Santa. A group of devotees prepare to take off for a procession down the cobblestone streets of Antigua, a UNESCO World Heritage Site. 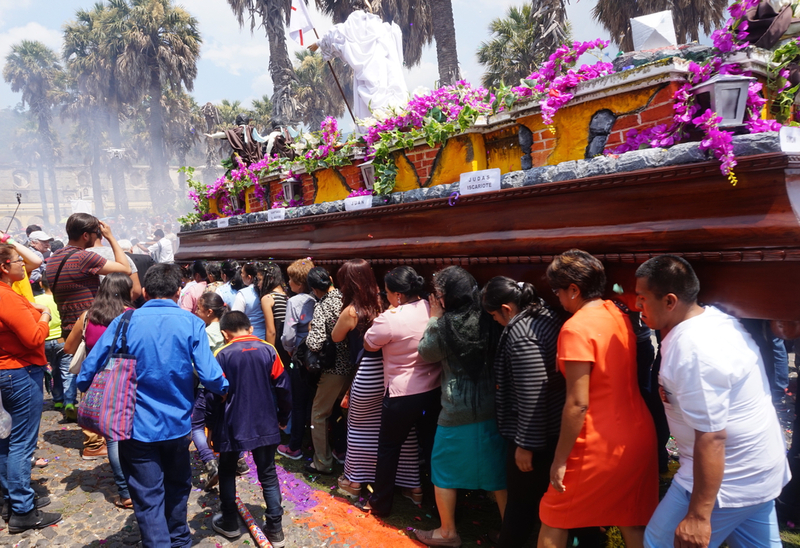 A procession depicting the Resurrection of Christ departs from the historical Iglesia La Merced in Antigua on Easter Sunday. 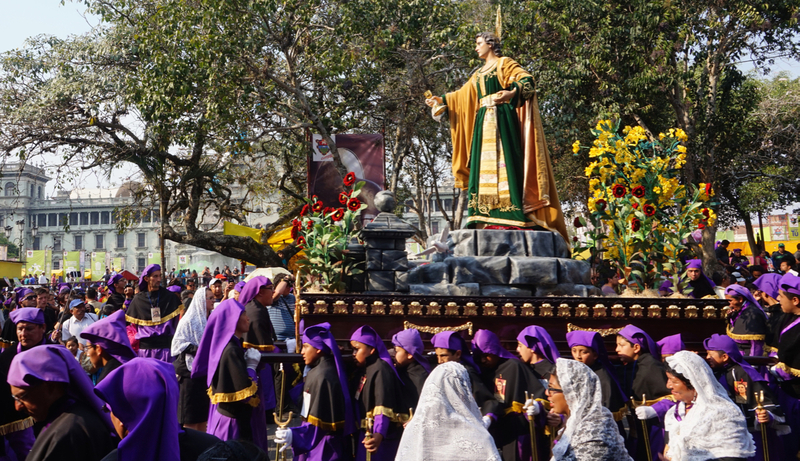 A sea of male devotees dressed in purple robes, a color historically known to be associated with both royalty and suffering, flood the streets during the holy week while women devotees can traditionally be found dressed in either all black or white. 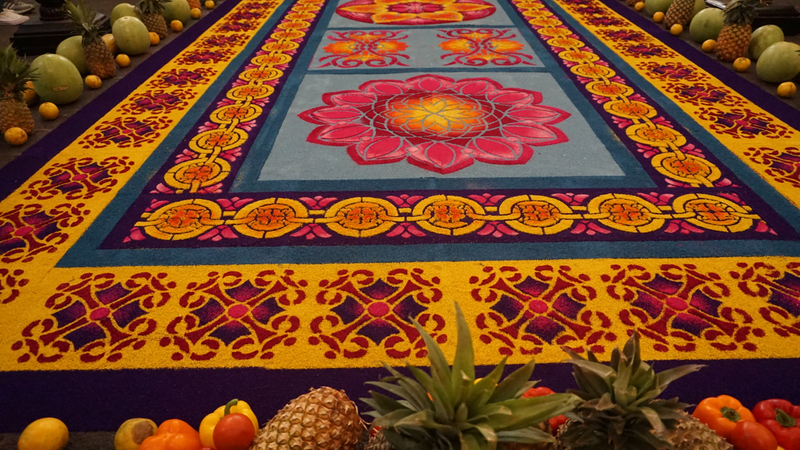 The streets the processions go through can be found blanketed by intricate alfombras (carpets) created from either colored sawdust, sand, flowers or even pine needles. Oftentimes, fruits and vegetables are included as offerings. 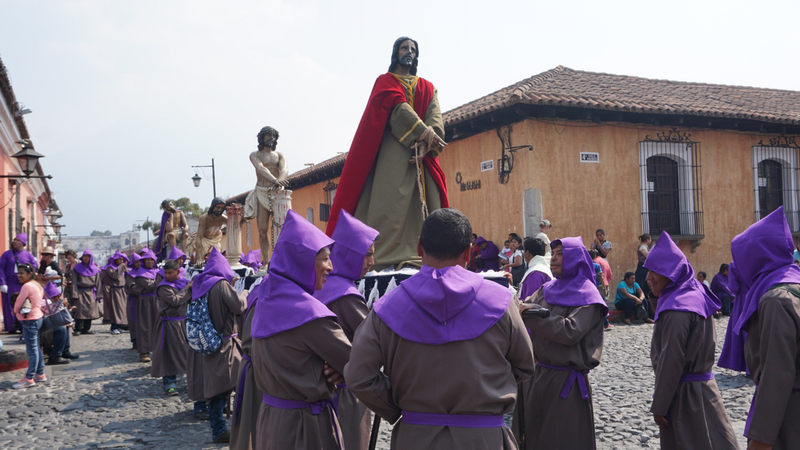 Clouds of smoke and the smell of incense fill the air as gigantic floats, weighing several tons, with sculptures depicting various images of Jesus are carried throughout the streets. 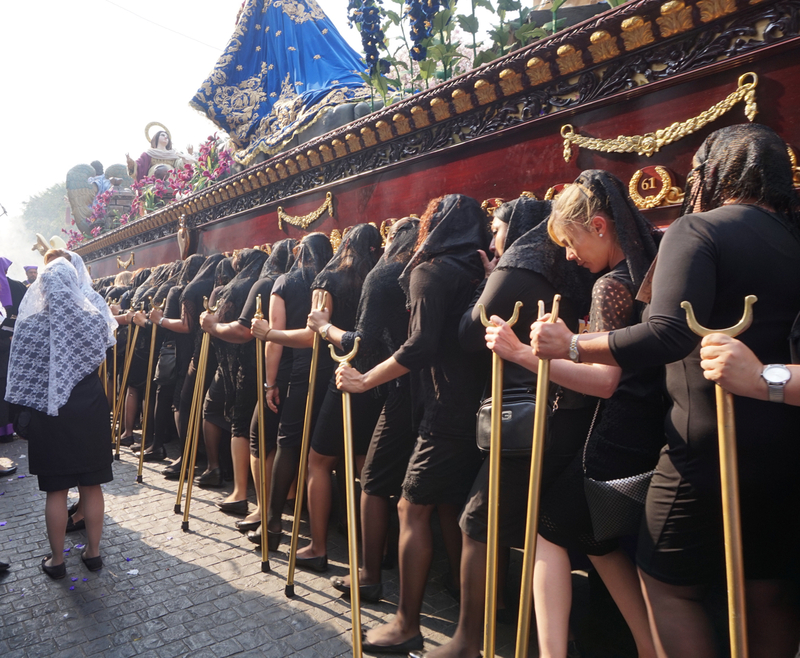 Each procession leaves its church and follows a route before returning several hours later. 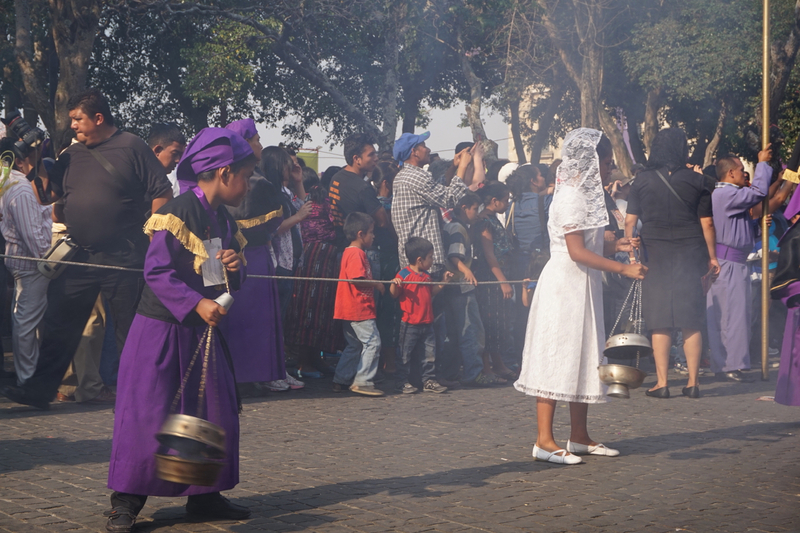 The Cucuruchos (carriers of these floats) participate as a form of penance and devotion. Bookings are required up to a year in advance to be a participant, with heftier fees required to be closer to the front. Born and raised in Southern California, Kanchan, at a young age, had the opportunity to experience life outside of her home country through frequent trips to her family’s homeland of India, as well as other countries in Asia and Africa. Disturbed by the inequalities she observed during these travels, Kanchan arrived to college committed to understanding the significance of social power, and chose to major in Sociology. 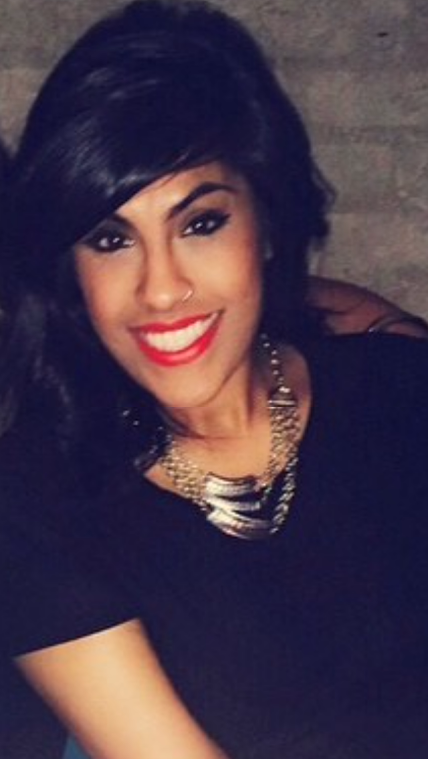 Upon graduating, in an effort to affect long-term social change, Kanchan worked with U.S. Senator Barbara Boxer and California State Assembly Speaker Emeritus Karen Bass before joining the national AmeriCorps program, Public Allies. Through this opportunity, Kanchan received an apprenticeship with After-School All-Stars (ASAS), an education nonprofit which provides free after-school programs to low-income, at-risk youth across the U.S. Through her work at ASAS, Kanchan had the privilege of helping thousands of youth foster a sense of self-esteem through exposure to activities that gave rise to self-sufficiency and prosperity. Kanchan is excited to take her skills and experiences to Central America as a Kiva Fellow and to learn about the effective and sustainable practices that microfinance can have in contributing to transformative change.